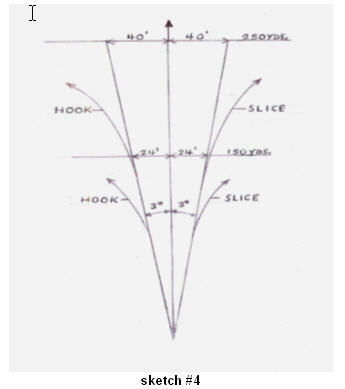 This engineering analysis was written by Harry Lundberg, an experienced golf industry consulting engineer who has worked with many top golf industry engineers and holds numerous golf patents. In addition, he has worked with many top PGA, LPGA and Senior PGA professionals. The technical analysis starts off in easily understandable language describing his experience teaching Symple Swing to all types of students from beginners to pros. About 3/4 of the way in it does get into analyzing the actual physics of the Symple Swing formulas. This engineering analysis compares the traditional golf swing to Symple Swing which is a next generation golf swing. – A significant increase in distance. Tests using players of all levels including pro’s showed gains of 10 to 25 yards, with the greatest gain going to the higher handicappers. – An enormous increase in accuracy. Above all, golf is a target game. Improved accuracy is vital to better scoring. – A repeatable swing that can be learned in days and taken to the course almost immediately. 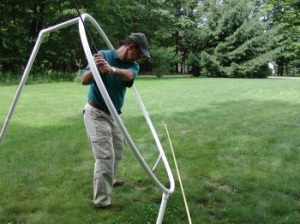 – A swing that can be modified readily with little adjustments to suit different anatomies. – A swing that is still with the player after a long layoff. To see how Symple Swing solves the problems in the golf swing we must simultaneously explore the difficulties commonly experienced and why they occur. Symple Swing solves all of the above with very definite, special, power thumb grip; front arm position; and a unique wide stance that takes all of the guess work out of the set up. It can be learned in 10 to 30 minutes. Any of these common faults, or combination, prevents a powerful on plane hit and reduces energy transfer to the ball. Accuracy is greatly reduced. With the proper set up and grip, Symple Swing allows the player to arrive at the top of the backswing in a tight, compact position. All he needs to do is rotate the shoulders and top of the spine to initiate the takeaway. He will make a one piece backswing into a defined “slot” at the top. Swaying, elevation changes, casting – all of the above difficulties – are eliminated. 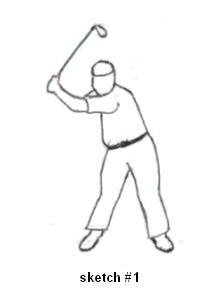 Sketch #1 shows the player finishing his backswing using a five iron, employing the Symple Swing setup and takeaway. There are 6 principal ellipses in the golf swing – feet; knees; hips; wrists; arms; and shoulders – that have to be on the right plane, unique to each and in proper sequence. These will vary for each and every player, and must be individually tailored. The torques on the club can be considered as five, including one from gravity acting on it. The torques on the arms are generally five as well including a shift towards the target while rotating the body. These complex motions are extremely difficult to do for all but the talented few. Even they require constant practice to hold their swings together. As we know, even top Tour players lose their swings suddenly and have great difficulty correcting the problem. 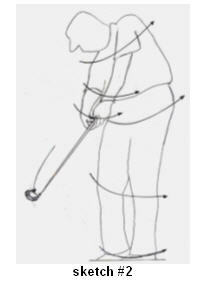 Symple Swing is essentially a single axis swing that eliminates these complications, as can be seen in the sketch below with the player using a five iron. By establishing a plane to the top during the backswing the player then swings by rotating his upper body on the same plane to impact with the ball. The hands automatically uncock into a position of a powerful “late” release, as can be seen in the hand position above just after striking the ball. The right calf automatically thrusts forward, adding horizontal thrust and added mass to the shot. The combination of movements turns the front hip slightly out of the way, while the left leg also forms a solid post against which the right side is fired with power. Any troublesome lunge is eliminated. The only variations, from player to player, will be in ball position – distance from the body and location along the target line in the stance. Once the basic setup and takeaway are learned, these can be readily determined. Strictly speaking, the wrists do form a second axis. 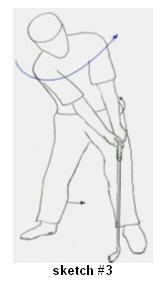 However, the Symple Swing unique grip and front arm setup forces the wrists to be in the same plane of rotation while cocking in the backswing; and to release along the same line during uncocking in the downswing. A 3 deg. closed face pulls the ball to the left of target by 24 feet. A 3 deg. open face pushes the ball to the right by 24 feet. A pulled hook sends the ball much farther off target and may propel the ball too far as well. A slice sends the ball much farther off target and will probably come up short as well. A 3 deg. closed face pulls the ball to the left fo target by 40 feet. A 3 deg. open face pushes the ball to the right by 40 feet. A pulled hook sends the ball much farther to the left, mostly likely in the rough, or worse. A slice sends the ball much farther to the right and will definitely be short, probably in the rough, or worse. Not shown is the pulled slice. This may drop somewhere near the target line but will certainly come up short. During a typical round, the average player often strikes the ball with more than a 3 degree face angle error. The results are proportionately much worse. 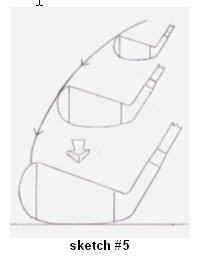 (The drawing has a slight perspective error, deliberately done to show the square face position at all stages more readily). Failure to hit fairways, and greens in regulation, are the most common faults of the average player. Straight shots down the target line will lower the score faster than any other improvement he can make. Even if the player cannot reach the very long holes in regulation, in spite of the added distance he will get from Symple Swing, he can expect very accurate pitches and chips that give him a reasonable putt for PAR. Shots with open or closed faces are generally glancing blows as well and impart less energy to the ball. This produces shots shorter than he should get from the energy he is using while swinging. Square contact increases distance with no additional effort. A- From Newton’s 2nd law, Force = Mass times Accelaration (F=MA) the complex equations of mechanics are derived. Ignoring the fact that properly fitting clubs will help, the golfer has just two areas ( the two variables ) to work in. 1. He can somehow increase his acceleration to a higher impact velocity. 2. He can somehow increase the mass contribution to the hit. It will be seen that as you work on the technique to improve one variable, the second one is also helped. B – By calculation, it takes roughly 36 lbs. 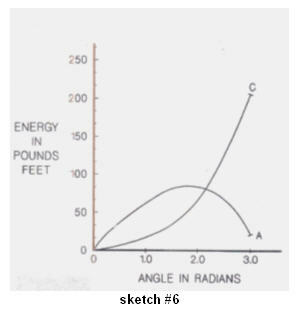 of force to accelerate a typical driver to an impact velocity of 100 mph. ( This will vary depending upon the moment of inertia of the club used ). For most people this is not feasible by using the arms and hands alone. To swing at a maximum speed to whatever the individual’s body can achieve, the large muscles must be employed. These are the legs, hips, the lower back and the shoulders. The object of the golfer is to pass energy from the body, through the arms, into the shaft and finally to the clubhead. This requires both force and technique. Done correctly, the arms will slightly decelerate in the lower part of the downswing and transfer energy into the shaft. Since the flow of energy of motion – kinetic energy or KE– is passing from a larger source into the smaller, tapered shaft, the shaft will operate rather like a whip and accelerate. KE = ½ MV squared. Since the torque applied is essentially constant, as the energy flows into a smaller mass or M, the velocity or V must proportionately increase to maintain the balance of the equation. In a properly executed swing club head speed will increase significantly. 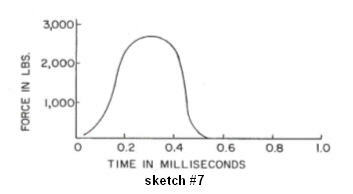 In sketch #6 we see a pro swing his driver to a speed of 110 mph, with the arms slowing and the club head speeding up. During the downswing, with the customary “late” hit position of the wrists, he passed energy into the shaft which accelerated it and bent it so that it stored elastic energy. This in turn slowed the arms, by Newton’s 3rd law of equal and opposite action. Although the average person cannot generate the power to swing at 110 mph, the principles apply just the same if more distance is to be gotten. Typically the average player shoves the club handle forward in an attempt to gain velocity. By doing this, the clubhead lags, no energy is stored in the shaft, velocity is minimized, and the hit is weak. The special setup puts the player virtually in the hitting position at the start. This enables him to actuate all the big muscles while taking a short backswing. The release springs those muscles into a powerful late hit. Elastic energy is stored in the shaft and released at the right time. The right side fires through the stroke automatically against a solid left leg, adding both velocity and mass contribution. The left shoulder is acting as a pivot point that extends the arms and slingshots the clubhead forward. The net result of this technique is more distance without the player feeling that he has to supply more force than normal. Eliminating the strain of trying to hit harder leads to easy acceleration and more distance. Since the clubhead is on plane during the entire swing, it will strike the ball squarely on center. This automatically increases the effective mass imparted to the ball, resulting in more distance yet. As the ball and the clubhead are both very hard and rigid, the collision time where ball and clubhead are in contact is extremely short, between 4/10,000’s and 5/10,000 of a second. The force of the collision, and impulse given to the ball, is very large as a result. This is an actual oscilloscope reading of an LPGA Tour pro striking the ball at 101 mph. The force is over 2600 lbs. at the peak. Unlike other sports, where the striking implement and the ball are relatively softer and the collision time is quite long, (say baseball), the golfer cannot add very much mass contribution to the hit. ( a large portion of the total mass is in the club itself ). The time is too short. Our research indicates that each added ounce of mass he can supply produces 7.5 yards of extra distance. When employing the classic swing he has to scramble using several sources, a little here and a little there. In Symple Swing it is all wrapped up in a single package. We cannot isolate the several masses that are involved to know how each is precisely contributing – club, all of the body parts, square contact – but the overall results can be seen clearly. In cases where the player was new to Symple Swing and had not yet learned how to increase swing speed, typical increases in distance were 12 to 20 yards. We have not yet isolated the exact amount that elastic energy from the shaft adds to the total increase of clubhead speed. Calculations indicate between 2 to 5 mph, varying with the player and the club used. A 4 mph increase computes to around 13 yards of added distance, using a driver. Obviously Tour pro’s already execute well using the classic swing. They don’t need anything else except lots of practice. However, most players can increase their results by employing Symple Swing for the two essentials – accuracy and distance – easily, far faster and with lasting results, than can be gotten with the classic swing.